« Prosperity and Taxation: What Can We Learn from the 1920s? I’ve just finished up a week of lectures and meetings in India. It was an interesting trip, but not an encouraging trip. My first observation is that Indians are enormously successful when they emigrate to the United States. And they also do very well when they migrate to Singapore, South Africa, and other place around the world. Yet Indians in India remain comparatively poor. 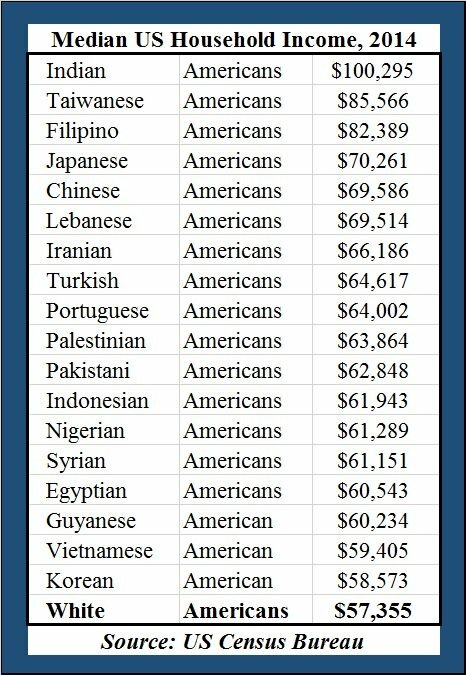 Per-capita income is only $5,350 based on purchasing power parity (and far lower on a exchange-rate basis). Why the difference? Let’s start with Economic Freedom of the World, which measures the degree to which misguided government policy suppresses the private sector. The bad news is that India is ranked only #95, which puts it in the bottom half of the world. Its worst score is on trade, where India is a miserable #142. And since there are only 159 nations that are included in the Fraser Institute’s ranking, that’s close to the bottom. The regulation score also is quite bad. Not quite in the bottom third of nations, but close. Monetary policy and legal system/property rights (i.e., rule of law) are a bit better, but still in the bottom half of the EFW rankings. 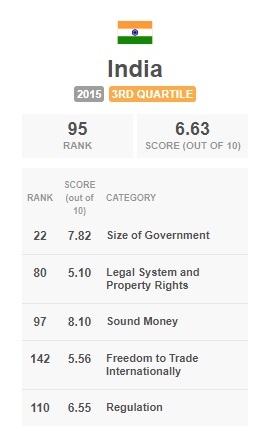 The country’s only good score is for fiscal policy. But I would argue that the #22 ranking is an overstatement. 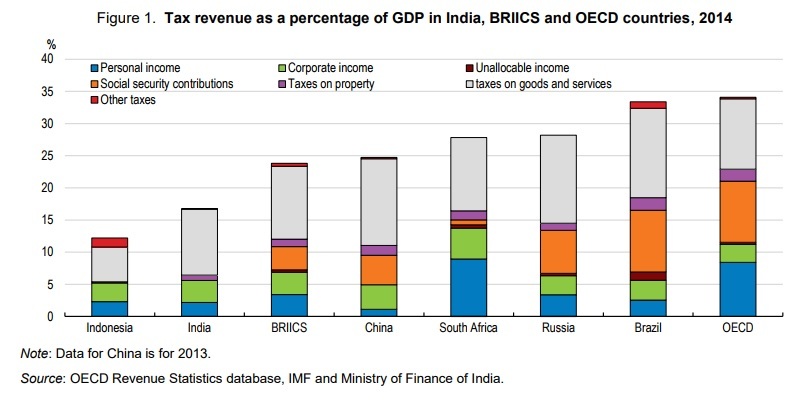 India does well mostly because the government is too disorganized and incompetent to collect a lot of revenue. That’s the only reason why the burden of government spending is modest. Below is a chart from EFW that maps India’s score starting in 1970. The good news is that India’s score – though still depressingly low – did improve considerably in the 1990s. But here’s a very important caveat. India’s score increased, but its relative ranking has declined. Simply stated, other nations have improved their scores at a much faster rate. Here’s some data on fiscal policy from a report by the Organization for Economic Cooperation and Development. We’ll start with data on tax revenue as a share of economic output. 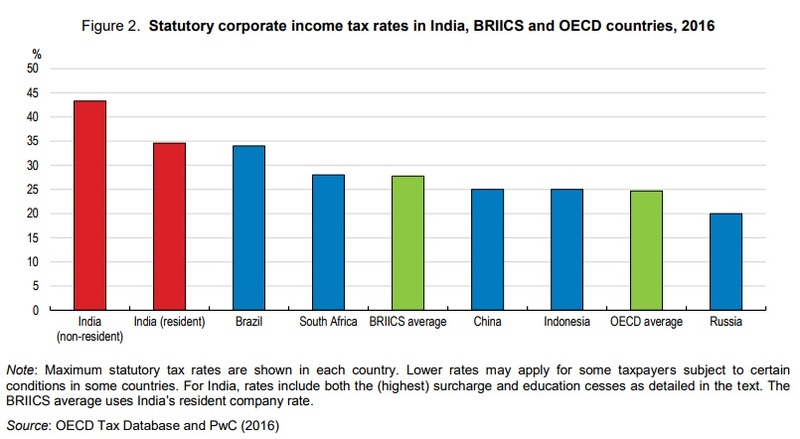 By that measure, India is a low-tax country. But now check out corporate tax rates. As you can see, the system is relatively onerous. So a possible conclusion, as I noted above, is that revenues are low because of an unfriendly tax system. Hello Laffer Curve. I’ll close by shifting from macro data to personal observations based on my trip. Here are four reasons why I’m leaving India with a pessimistic feeling. I had lots of meetings with people in the business community and there is not only skepticism of free trade, but also considerable support for protectionism. Similarly, the business community has a semi-favorable view of big government because the state is a source of subsidies and handouts. India has a federalist system, but state governments are basically administrators of programs designed by the central government (unlike Switzerland). The big “pro-market reform” in India has been the “single window” for regulatory clearances, when the right policy would be to abolish red tape altogether. But I’ll close with a bit of optimism (above and beyond what I wrote the other day about the burgeoning role of the private sector in education). There’s a saying in the country that “India grows at night, while government sleeps.” And there’s even a book with that title. In other words, policy is generally not friendly, but the private sector manages to find “breathing room” to operate in spite of government. So poverty is falling, slowly but surely. And hopefully globalization will gradually lead the government to be more open to trade liberalization and open markets. P.S. Another reason to be pessimistic about India is that the government recently imposed “demonetization.” Any nation that joins the war against cash generally has the wrong mindset. P.P.S. I can’t resist linking again to a truly bizarre case in India of government handouts encouraging very bizarre behavior. Indeed, at current levels of economic freedom it is unlikely that the Indians of India might join the developed world. However, for the typical complacent developed world voter-lemming, may I remind that even at current economic freedom levels India may very well be capable of reaching per capita income levels of 15k per year very fast. That would already make India an economy bigger than the US. Other very populous countries, like for example Indonesia, are on similar fast growth trajectories… and, of course, China which is almost there. The self righteous voter-lemmings of the western world don’t have that much time left to be smug. The bottom line is that when voters behave like lemmings and turn their countries into pitchfork democracies, their societies become so uncompetitive overall that soon even the Putins can challenge them. That is the fundamental tectonic transformation the western world is currently undergoing. In many ways it is the one underlying change that moves everything else. I can attest to the trade problems. At least, as of 15-20 years ago. Compared to other countries, it was ridiculously expensive and complicated to import products into India. Not just a little more, a LOT more.